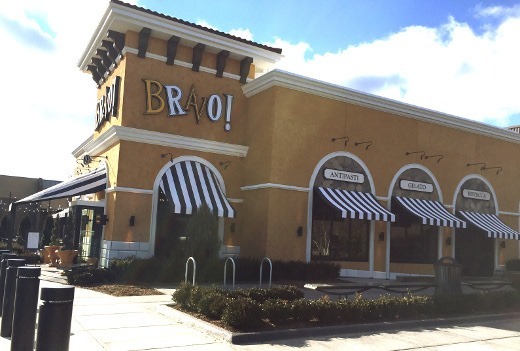 In December 2014, just a few weeks ago, BRAVO! 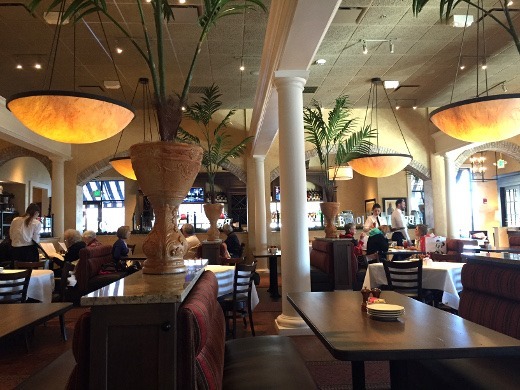 Cucina Italiana opened their 48th restaurant, located at Briarwood Mall in Ann Arbor, Michigan. Having not even heard of this relatively small chain previously, my interest was piqued when I was invited in for lunch last month, and I gladly accepted the invitation. BRAVO! Cucina Italiana operates in a stand-alone building between Macy’s and Sears at the mall, and is next door to the also new P.F. Chang’s. The interior is quite spacious and grand.The 6,551-square-foot restaurant offers indoor seating for 219 guests, including 41 bar seats, and, once the weather warms up, al fresco dining for up to 55 guests on an Italian-style terrace. I loved the dramatic columns and tall plants that decorated the restaurant. The seating was also well-spaced and we didn’t feel like we were right on top of other diners, which was nice. 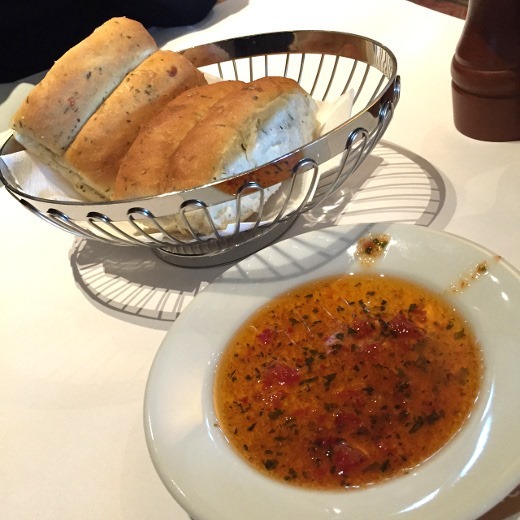 Meals are served with complementary warm, soft herb bread and dipping oil. 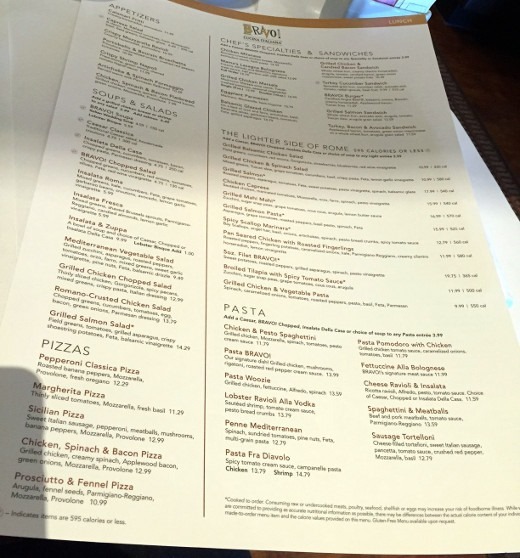 The menu features many selections, including appetizers, soups and salads, pizzas, chef’s specialties, sandwiches, and pasta. I appreciate the large “The Lighter Side of Rome” section offering dishes with 595 calories or less. 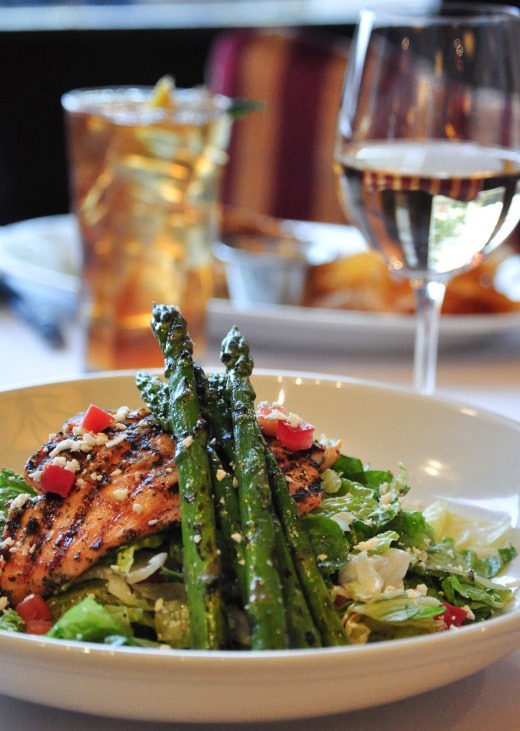 It is not always easy to find lower-calorie options at Italian restaurants. 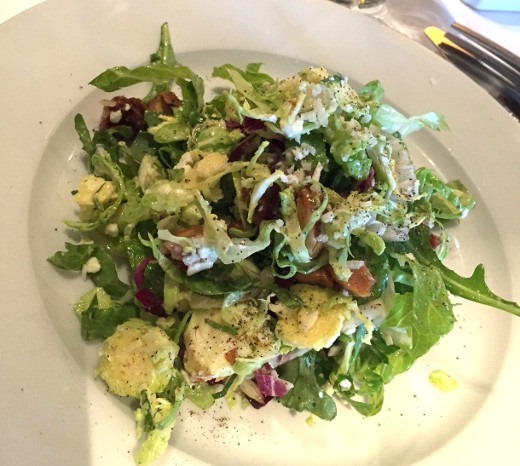 This salad was absolutely fresh and fantastic and I would go back to Bravo just to order it again! Love those shaved Brussels. My lunch entrée was tasty, and what I appreciated most about it was the ratio of ingredients. I loved the large volume of fresh ingredients (artichokes, fresh basil, spinach, tomatoes) featured in the dish compared to the smaller volume of heavy, filling pasta. The spicy tomato sauce did have a little kick to it, but was fairly mild. A generous number of sweet and tender little bay scallops were scattered throughout the dish. After starting my meal with bread and salad, I was only able to eat about half of my lunch entrée, and had the rest packaged up for dinner that night. The huz was in a burger mood and ordered a BRAVO! 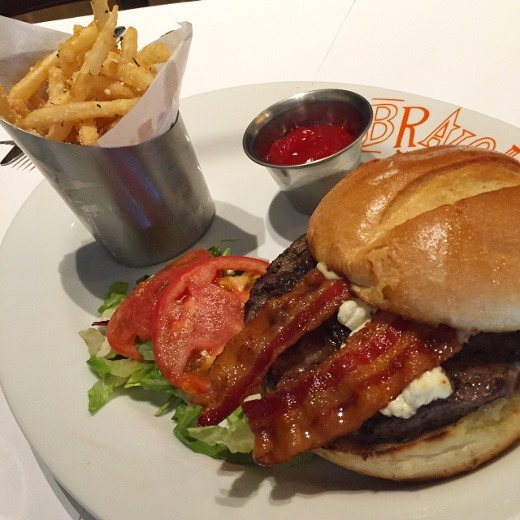 Burger (pretty standard, from what I understand), featuring blue cheese and bacon, served with some very delicious French fries. 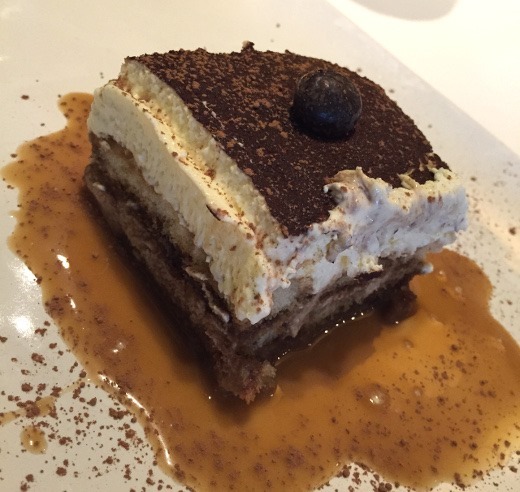 For dessert we shared a heavenly slice of tiramisu. I am salivating just looking at this picture again. Nom Nom. 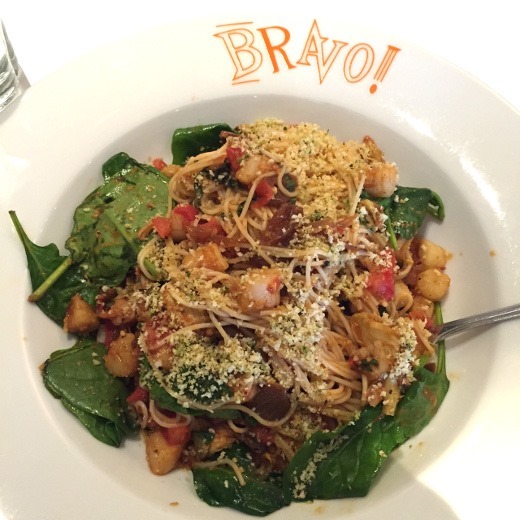 All in all, we enjoyed our nice three-course lunch at BRAVO! Cucina Italiana. In the genre of local Italian chain restaurants, I think they are one of the better, or best choices, that can be made, due to both their ambiance and selection of dishes featuring lots of fresh, vibrant ingredients. I loved that I didn’t leave feeling weighed down and heavy after eating lunch! Additional offerings at BRAVO! include Brunch, available Saturdays and Sundays from 11 a.m.–3 p.m.; BRAVO! Happy Hour, Monday–Friday from 3:30 to 6:30 p.m. and from 9 p.m. until closing; $5 Martini Wednesdays; and $5 Wine Thursdays with select wines for $5 at the bar. Nice! Thanks very much to the folks at BRAVO! for the lovely lunch! I always love reading your reviews – they’re so helpful! That’s great that they’ve got a sizable selection of light dishes, and what you ordered looks delicious. Thank you so much for the positive feedback, I really appreciate it! Yes, the “lighter” menu was a refreshing find and my healthy dish was filling and tasty.